BB NOTE: Surprising - but very happy news - that Dan Hertzog, who left the Episcopal Church to join the Roman Catholic Church and renounced his orders, has decided to return the Anglican fold and has been asked to return as a bishop and assist in his former diocese, the Diocese of Albany now under the steady leadership of Bishop Bill Love. Good news for the Communion Partners and for the wonderful people of the Diocese of Albany (hey Bruce Mason!). A major leader and voice returns to help bring The Episcopal Church back to its roots and to be voice for TEC compliance with Lambeth 1.10. Fascinating that the 815 gang are rejoicing - not sure if they completely grasp what this means for the orthodox in TEC - and for fellow bishops and comrades in the trenches, John Howe and Mark Lawrence and others. Bill Love gets it though!! As most of you are aware, shortly after his retirement as the Eighth Bishop of Albany, Bishop Herzog resigned his Holy Orders. In so doing, he made one of the most difficult decisions of his life, one that he has struggled with these past three years. He did so in obedience to his understanding of what he believed the Lord was calling him to do at the time in preparation for returning to the Roman Catholic Church, which was the Church of his youth. For the past three years, Bishop Dan and I have maintained our friendship and have talked on several occasions about his decision to return to the Catholic Church. After much thought and prayer he has discovered that his heart is still very much with the people and Diocese of Albany whom he truly loves and committed his entire 36 years of ordained ministry serving. Earlier this Spring, Bishop Dan asked if I would be open to him returning to an active ordained ministry as a priest in the Diocese of Albany. I asked him; if possible, would he consider coming back not only as a priest, but as a bishop in order to assist me in ministering to the Diocese. On Maundy Thursday, Bishop Dan and I went to New York to meet with the Presiding Bishop, The Most Rev’d Katherine Jefferts Shori. Bishop Dan rescinded his renunciation and the Presiding Bishop with the advice and consent of her Advisory Council, accepted and restored Bishop Herzog effective April 28, 2010. 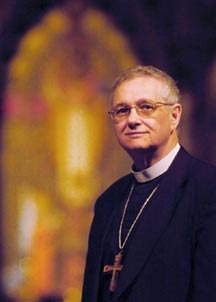 Earlier today, while meeting with the priests of the Diocese, during the Annual Priest Retreat, I announced that Bishop Daniel Herzog has been fully restored to the Ordained Ministry of this Church, with the attendant obligations of Ministerial office, and endowed with the right to exercise the gifts and spiritual authority as a Minister of God’s Word and Sacraments in this Church conferred on him in his Ordinations. I invited Bishop Dan to celebrate the closing Eucharist at the retreat. Though he has never really been absent from our common life, I invite you to join me in formally welcoming Bishop Dan and Carol back to the full communion of the diocese and the wider church. During the past three years, they have continued to support the work of the diocese and to participate in a non-ordained capacity. His restored role will be of help in carrying out the work of the Church, and I will be asking him to assist in this Diocese under my direction as is true of any retired bishop. Similarly, Bishop David Ball as been assisting me in various ways these past three years and by the grace of God will continue to do so. I am very appreciative to Bishop Ball a nd now Bishop Herzog for their willingness to join me in ministering to the people of the Diocese of Albany. All baptized Christians, both laity and clergy, have a share in the apostolic mission the Lord holds out for the Church and I am delighted that Bishop Dan and Carol can officially take their place among us again in the Diocese of Albany. I ask your prayers for all who labor for Christ and his kingdom across these nineteen counties. I want to extend my deep appreciation to Bishop Love and to Presiding Bishop Jefferts Schori for their kindness and pastoral solicitude. Carol and I are grateful for the continuing opportunity to serve our Lord and His church in the Diocese of Albany. My only plan is to assist in any way Bishop Bill directs. We are honored to resume a fuller place among the clergy and laity of the diocese. Big Tip of the Tinfoil to Matt and SF. BB NOTE: I first met Dan Hertzog years ago when he and I were both Regional Alpha Advisors (ARA) with Alpha North America. He came to a gathering I organized for ARA's at Truro and he was such an encouragement. In fact, the man I had assigned to pick him up from the airport was so inspired by Bishop Hertzog that he decided to pursue Holy Orders and is today ordained and serving in a diocese in Texas. Please read more about at SF. Wouldn't you consider it happier if he'd gone to CANA, ACNA or whatever the name is now instead of TEC? What were his reasons for leaving TEC? Have those things changed so that they were no longer valid reasons for being apart from them? Why did he return? I rejoice in his return. I continue to believe that TEC is stronger when there is theological diversity. When matters are not considered disputable by the church, we are not encouraged to seek diversity - but the truth .